We offer the cheapest rates to remove all types of waste - Building rubble, Construction waste, Garden rubble & debris, Household junk, Treefelling removal & waste, all types of waste. We also collect paper, plastics, carboard. We specialize in all types of waste removals. We use local guys in the area and only do legal dumping. Cheapest Rates in all Johannesburg areas,Midrand, Centurion, Twane. Free Quotes & We use local guys in your area to do the rubble loads so distance is closer. Professional Service & effecient collection and dispostal to legal dumping sites. Site Clearance and General clean up. Removal of all types of waste clean-up. Prices include labour & basic tools to load rubble or waste. Additional costs on TLB hire. We offer special monthly rates on contracts - Townhouse complexes, Construction Co's, Shopping Centres, Developers & Our special regular customers. Legal dumping sites only. Dumplling clearance certificates available upon dumping & upon request. We also only use local guys in your area. Areas we cover : All areas in Johannesburg North, South, East & West Jhb, Midrand, Pretoria, Centurion. Centurion - Menlyn, Midstream,Highveld, Erasmia, Eldoraine, Garsfontein, Clubview, Die Hoewes, Rooihuiskraal & all Pretoria East surrounding areas. Rubble Removals JHB takes pride in the fact that we have a well established footprint in the Greater Johannesburg area, Midrand, Centurion and Pretoria areas. We are known for our affordable, efficient and reliable service, cheapest prices, but more importantly excellent customer service and that we ensure our staff do all legal dumping. We go the extra mile for all our clients. Customer service in this industry is very important and thus establish ourselves as the most reasonable and friendly services in the Rubble Removal Industry. We also do Skip bins removals, which works out cheaper, rather than renting a skip and have special prices if on a regular basis skips need to be emptied. We offer cheaper rates on loads if exceeding more than two loads. We offer Free quotes. Our prices are reasonable and affordable and cheapest in Johannesburg for rubble removals. Our team of guys have years of experience in the Rubble industry and can handle all types of rubble loads, terrains and deadlines. As we include our labour in the prices, this also includes tools to load the rubble such as wheelbarrows etc. TLB's are optional and that is an extra charge. Quotes are provided immediately, based on your requirement telephonically. Should you send us a picture via Whatzup or text message us on cel no. 079 227 8842 / 076 522 3570, we are able to give an estimate. We collect all types of Rubble : Building rubble, Renovation rubble, sand, cement, tiles, stones. Garden waste, garden debris, refuse rubble, refuse dusbin bags, ceiling boards, building supplies, collections, deliveries from various hardware stores, household items, household junk, small scale furniture removal, open truck loads, tree stumps, tree felling loads, bricks and even remove kennel doggy waste. Office & Business Waste collection. Construction waste. We remove all types of waste products. In some cases unusual wast products, provided it is non-hazardous, as many of the dumping sites are restricted with regards to highly toxic waste and also not suitable for our normal Municpal landfills. Charity collections : We provide a service by collecting the goods in good or a damaged state and in turn, are utilized by our Charities or if not, we then dispose of these goods or materials that cannot be utilized to various legal municipal dumping sites within the Gauteng & Twane areas. In some cases, items we recycle items such as cardboard, paper, plastic etc. We support various charities & lists available upon request for the registered NPO's. We also like to give back to the community by supporting them with materials that we obtain from time to time. We load & go.... Our job is to take your rubble away and dispose of at legal dumping sites. 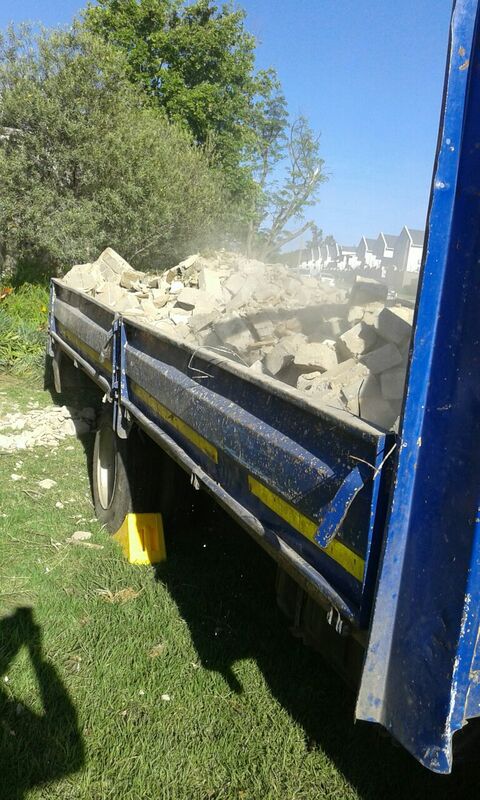 Rubble Removals Jhb has been in existence since 2010. We pride ourselves in giving the best customer service, with the best price in Jhb, as well as professionalism, reliabilty and customer service. Our prices are reasonable, our staff friendly and we dump your rubble at legal dumping sites only! We pride ourselves in our staff & their ethics with regards to removal waste and disposing thereof in designated areas as set out by the various Municipalities. We endevour to maintain high standards. Customer Service is of the utmost importance to us! Our Rubble Contractors are reliable, honest and try to be on time, as they understand our customer's requirements and time limits. Our panel of rubble contractors are carefully selected and strict criteria is adhered to. We offer free quotes. Our prices include labour. Our drivers have valid drivers licences and all their trucks are roadworthy. All our drivers are required to meet certain criteria, in order to be listed on our books. We do criminal and credit checks. We do small, medium to large loads varying from 1 ton truck sizes, 2, 3, 5, 6, 8, 10 tons and our largest is a 16 tonner. Depending on your requirements, flat bed trucks or tipper trucks are also available. We charge according to your types of rubble and the tonnage.